Have an Anatomically Awesome Thanksgiving! | What's In John's Freezer? Have an Anatomically Awesome Thanksgiving! 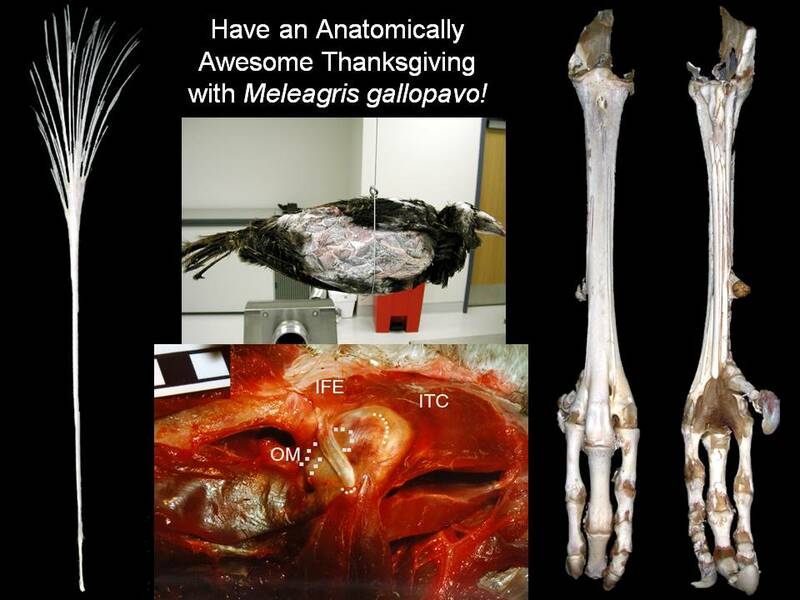 Hey, Americans and others happening to be gobbling down Meleagris gallopavo today– don’t forget to practice your anatomy! Such a great opportunity. Dig in to that carcass and horrify/amaze your family and friends! This pic might help you get started (info below if you want it), and is my WIJF blog wish of happiness to you all, today. Stomach-Churning Rating: 6 out of 10; a small picture of some fresh turkey leg muscles, but not that bad really. On the left: an ossified (turned into bone!) tendon, probably part of the M. flexor perforans et perforatus group (a wickedly complex set of muscles that go from the knee region to the toes, and act mainly to flex the knee, extend the ankle and (plantar)flex the toes; i.e curl the toes up). What’s particularly cool is that, towards the top, you can see the divisions where the pennate (angled) fibers of the short, meaty muscle belly sat. If you are eating a turkey drumstick, you will be picking some of these out of the meat, although many turkeys seem to have fewer bony tendons due to human breeding and young age at slaughter. In the middle, top: a crude experiment where we hung a frozen turkey’s body in a few different orientations to determine its centre of mass, important for biomechanical calculations. Mad science, but simple science. The OM is the obturatorius medialis (obb-turr-ahh-tor-ee-us mee-dee-ahl-iss), an antagonist to the ITC, used to swing the leg. It is mostly hidden inside the pelvis so you just see its tendon (dotted line), and especially in turkeys (seriously, they have very nicely visible muscle attachments on their leg bones, for any bird! ), a little knobby bit of bone that helps guide the tendon to keep it in its little groove on the femur. Unless you’re very industrious and break open the body cavity to excavate into the pelvis, you won’t be eating this muscle. The IFE; M. iliofemoralis externus (ill-ee-oh-fem-oh-rahl-iss ex-ter-nuss); arching over the ITC and OM tendons, is a vestigial muscle, often lost in birds, and having little major function but helping a bit to draw the leg away from the body (abduction). Even though it is a puny muscle, it still has a nice little pit for its insertion on the femur. Turkeys are just cool that way. But it’s not much in the way of eating. And now you know three of the ~40 main muscles of the avian leg, well done! On the right: the foot of a turkey in front and back views. Lots of ossified tendons are visible if you squint. Why do birds only have ossified tendons below their knee joints, and why only some muscles in some birds, and not so commonly in most other species of land animals? This is one of those cool mysteries that remain for people doing evolutionary or biomechanics research to sort out. Hope you enjoyed a quick anatomy tour with our pal Meleagris! 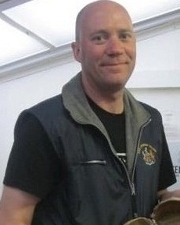 on February 13, 2013 at 4:59 pm | Reply On the Third Day of Freezermas, this blog gave to thee… « What's In John's Freezer? on November 23, 2017 at 12:54 pm | Reply You Thaw That, We Thaw These | What's In John's Freezer?